Brocade DCX 8510 Backbones are the industry’s most powerful Fibre Channel switching infrastructure, providing the most reliable, scalable, high-performance foundation for private cloud storage and highly virtualized environments. They are designed to increase business agility while providing non-stop access to information and reducing infrastructure and administrative costs. Networks need to evolve in order to support the growing demands of highly virtualized environments and private cloud architectures. Fibre Channel, the de facto standard for storage networking, is evolving with the data center. 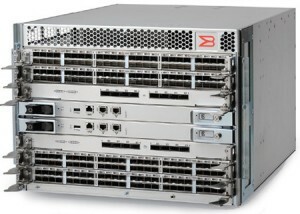 The introduction of Brocade DCX 8510 Backbones with 16 Gbps Fibre Channel delivers a new level of scalability and advanced capabilities to this robust, reliable, and high-performance technology. This enables organizations to continue leveraging their existing IT investments as they grow their businesses. In addition, they can consolidate their Storage Area Network (SAN) infrastructures to simplify management and reduce operating costs. Networks are evolving in order to adapt to rapid growth and change in the server and storage infrastructure. New optical Inter-Chassis Links (ICLs) can connect up to 10 Brocade DCX 8510 Backbones, enabling flatter, faster, and simpler fabrics that increase consolidation while reducing network complexity and costs. ICLs enable scalable core-edge and active-active mesh chassis topologies. These high-density chassis topologies reduce inter-switch cabling by 75 percent and free up to 33 percent of ports for server and storage. This maximizes overall port density in the lowest amount of rack space. Automating and simplifying SAN management enables data centers to quickly adapt to change and overcome disruptions in a private cloud infrastructure. Brocade DCX 8510 advanced diagnostics, monitoring, and management reduce end-to-end SAN management complexities and costs. Emerging and evolving critical workloads and higher density virtualization are continuing to push the limits of SAN infrastructure. The Brocade DCX 8510 features industry-leading 16 Gbps performance and 8.2 Tbps chassis bandwidth to address next-generation I/O- and bandwidth-intensive applications. Chassis Single chassis: Up to 384 (Brocade DCX 8510-8) or 192 (Brocade DCX 8510-4) 16 Gbps universal (E, F, D, M, and EX) Fibre Channel ports using 48-port 16 Gbps Fibre Channel blades. Up to 512 (Brocade DCX 8510-8) or 256 (Brocade DCX 8510-4) 8 Gbps universal (E, F, D, M, and EX) Fibre Channel ports using 64-port 8 Gbps Fibre Channel blades. Multi-chassis with ICL ports: Up to 3456 16 Gbps universal Fibre Channel ports (using 16 Gbps 48-port blades); up to 4608 8 Gbps universal Fibre Channel ports (using 8 Gbps 64-port blades); ICL ports (32 or 16 per chassis, optical QSFP) connect up to nine chassis in a full mesh topology or up to 10 chassis in a core-edge topology. Connecting five or more chassis via ICLs requires an Enterprise ICL license. Special-purpose blades Brocade FS8-18 Encryption Blade provides plug-in encryption of data on disk or tape, supporting industry-standard AES-256 and DataFort-compatible encryption mode (16 8 Gbps Fibre Channel ports; up to four blades; requires Brocade Network Advisor). Brocade FX8-24 Extension Blade provides SAN extension over IP networks (12 8 Gbps Fibre Channel ports, 10 1 GbE ports with license option for up to two 10 GbE ports per blade; up to four blades). ICL bandwidth 1.024 Tbps; 16 ICLs provide the equivalent of 64 16 Gbps ports. Each ICL port provides 64 Gbps bandwidth over a QSFP (4X16 Gbps) link. Frame-based trunking is enabled between four ICLs. DPS distributes exchanges across all frame trunks. Switch latency Locally switched port latency is 700 ns; blade-to-blade latency is 2.1 μsec; encryption/compression is 5.5 μsec per node; Forward Error Correction (FEC) adds 400 ns between E_Ports (enabled by default). FICON FICON cascading (Brocade Fabric OS: Brocade DCX 8510-8, DCX 8510-4); support for lossless DLS; FICON CUP; Advanced Accelerator for FICON (FICON Global Mirror and XRC emulation and read/write Tape Pipelining). The Brocade FC8-64 blade does not support FICON.